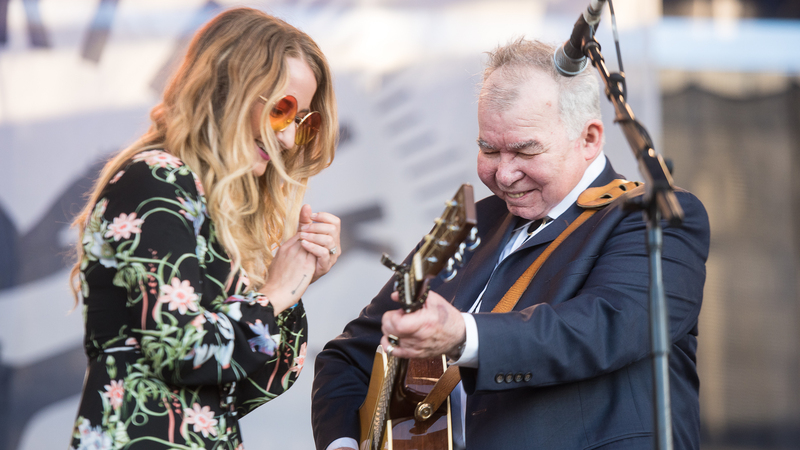 Sunday evening's final set at the Newport Folk Festival is frequently a triumphant, all-star affair — and John Prine's performance this year proved true to form. The massively influential songwriter welcomed a rotating cast of guest artists onstage to sing some of his timeless tunes. Justin Vernon, who dedicated a set at his Eaux Claires festival earlier this summer to Prine's music, sang "Bruised Orange (Chain Of Sorrow)." Margo Price joined Prine for what he explained was the only duet he'd ever written, the irreverently romantic "In Spite Of Ourselves." Roger Waters, who'd sung "Hello In There" at 2015's festival, turned up for a reprise. And seemingly every artist left at the festival crowded the stage at the end of the set for a celebratory singalong of "Paradise." The love everyone bore for Prine was evident throughout. Jim James summed it up when, after his duet on "All The Best," he retreated to a spot just offstage to watch the rest of the set, mouthing lyrics with clear reverence. As delightful as the collaborations were, it was even more gratifying to hear Prine himself cracking wise and imbuing his witty, trenchant lyrics with the time-worn gravel that's roughened up his voice for the last couple decades. Each of his guests can certainly do Prine's music justice, but the performance was a welcome reminder of our good fortune that Prine is still around to sing us his own songs — each one, like their creator, a hardy American treasure. "Bruised Orange (Chain Of Sorrow)"
"That's The Way The World Goes Round"